Serve the community and keep the public safe with one of the many careers in the field of Corrections. A degree in criminal justice opens doors in a wide variety of fields. Explore programs that are best suited for your chosen career. 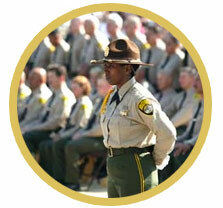 Prepare for the correctional officer exam and review helpful tips about the application process. It’s an unfortunate fact - the prison population in the United States is the largest in the world - by a wide margin. 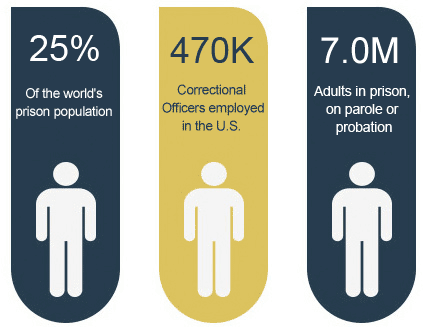 In 2011, the total correctional population in the U.S. ballooned to over 2.2 million incarcerated adults and 4.8 million adults on probation or parole. These staggering figures equate to 1-in-34 U.S. citizens, or approximately seven million adults under some form of correctional supervision. United States prisons alone, account for over 25% of the world's prison population. Correctional Officers, who are the center piece of the correctional system, are responsible for protecting the public by ensuring that federal inmates serve their sentences, that correctional facilities are secure, and that inmates are able to successfully re-enter the community upon release. With the number of people under supervision- either as inmates or parolees- expected to remain near record levels across the country, the impact of correctional officers on the criminal justice system is immeasurably large. Finding a high quality degree program has become an essential first step in every officer's career, with correctional departments and law enforcement agencies emphasizing education and training. Programs catering to aspiring correctional officers combine principles of the criminal justice system, sociology, psychology and the legal system with practical training in techniques for crime detection and the handling of inmates. With potentially hundreds of programs available nationwide, we aim to help students find top programs by offering in-depth school rankings for important criteria, such as popularity, affordability and return on investment. See rankings. Police officers are central figures within the law enforcement system, with responsibilities that routinely involve responding to emergency calls, monitoring criminal activity, investigating crimes, making arrests and taking part in community educational programs. Their jobs can be extremely challenging, yet incredibly rewarding. In most instances, a police officer is required to have a minimum of an associate’s degree in Criminal Justice, but many choose to earn a bachelor’s degree in Criminal Justice or Criminology. As of 2013, police officers earned an estimated mean salary of $58,720, with the top 10% earning a mean salary of $90,700. Probation officers, also known as correctional treatment specialists, are responsible for monitoring the conduct of non-incarcerated criminal offenders. The goal is to prevent the prior offender from committing new crimes by providing them resources such as rehabilitation programs and job training. Most employers require a bachelor’s degree in criminal justice, social work, behavioral science, or a related field. Some employers require a master’s degree. As of 2012, the average annual salary for a probation officer was $48,190. The top 10% earned more than $83,410. A crime scene investigator, also referred to as a forensic science technician, is a law enforcement officer who is specially trained to analyze and document evidence at the scene of a crime. The educational requirements are set by the law enforcement department hiring the investigator. Some agencies will accept a two year degree; however, most require a bachelor’s or master’s degree. The degree should have an emphasis on scientific subjects and criminal justice. The estimated annual wage for a crime scene technician was $52,840 in May of 2012. The top 10% in field earned over $85,210. Game wardens, also known as fish and game wardens, patrol assigned areas to enforce the fish and game laws. They also investigate reports of damage to crops caused by wildlife. They compile biological data and submit reports which ultimately are used to set wildlife population management goals. The educational requirements are set by the governmental unit hiring the game warden, but preference is given to candidates who have prior law enforcement experience, military experience, or an associate’s or bachelor’s degree in criminal justice. In 2013, the estimated average salary was $50,470. The top 10% of game wardens earned more than $71,510.00. A state trooper is a police officer employed at the state level. State troopers protect the lives and property of the citizens of their state. Most states require a minimum of a bachelor’s degree in a field such as criminal justice, previous law enforcement experience, or military experience. According to the Bureau of Labor Statistics, in 2013 police officers earned an estimated mean salary of $58,720. The top 10% earned more than $90,700. State police officers typically make slightly higher wages than their locally employed counterparts. A forensic scientist performs comprehensive chemical and physical analyses on crime scene evidence. They are also responsible for providing courtroom testimony. At a minimum, a bachelor’s degree is required for employment in this field. Advancement will require a master’s or PhD. In addition, most forensic scientist complete specialized training programs such as the one provided by the Federal Bureau of Investigations. Forensic scientists are classified by the U.S. Bureau of Labor Statistics as forensic science technicians. The estimated annual wage for a crime scene technician was $52,840 in May of 2012. The top 10% in field earned over $85,210. A criminologist studies and analyzes human behavior for the purpose of developing policies and procedures which reduce crime. Criminologists also study the effectiveness of the criminal justice system. Criminologists are employed by the government and the private sector. The educational requirements to be hired vary widely, however a majority of employers require either a bachelor’s degree or a master’s degree in criminology, psychology or sociology. The Bureau of Labor Statics includes criminologist in the category of sociologist. In May 2012, the estimated annual wage for sociologists was $74,960. The top 10 percent in the field earned more than $129,760. Security officers patrol and protect public and private property against theft, vandalism, terrorism, and illegal activity. The majority of security officers are employed privately, and acre considered an agent of the employer. A degree in criminal justice is always a plus to ensure the security guard has a solid knowledge of law enforcement protocols and to avoid potential lawsuits against the employer. In 2012, the estimated annual wage for security guards was $24,020. The top 10 percent in the field earned more than $42,560. A loss prevention manager, also known as a loss prevention agent, works to protect a company’s assets against theft or other loss. In a corporate setting, a manager may be in charge of detecting and reducing employee theft. In a retail setting, the agent may be in charge of programs to reduce or diminish losses or theft such as shoplifting. The minimum educational requirements needed to be employed as a loss prevention manager vary depending upon the employer. A degree in criminal justice is often viewed as a bonus by employers because of the broad training received in areas such as crime detection and criminal behavior. The Bureau of Labor Statistics includes loss prevention managers in the category of private detectives. In 2012, the estimated annual wage for private detectives and investigators was $45,740. The top 10 percent in the field earned more than $79,790. We provide the answers -sourced from experts in the field- to a full array of important questions posed by candidates seeking employment and officers already progressing in their career. Each FAQ provides detailed information about important topics such as: the basic requirements for employment, training & education, job conditions, conflict-resolution, navigating promotional opportunities, and salary. If you only have a few minutes to spend reading about the profession, start here. +Q.What is the formal approach to resolving issues in the workplace? +Q.What is it like to work as a correctional officer? +Q.How do I get hired as a correctional officer? +Q.What are the education requirements to become a Correctional Officer? +Q.What are the minimum requirements to become a correctional officer? +Q.What are the duties of a correctional officer?